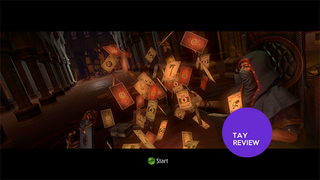 Hand of Fate is a breath of fresh air, because it takes so many other used concepts and puts them together in a perfect mashup. Hand of Fate is a card based role-playing adventure game which is ridiculously hard to explain without actual gameplay, so to give you a quick overview of what its like, I made a quick video with two minutes of gameplay which shows off traveling through the card based maps, and a little bit of the combat. Using the card dealer as a narrator of the game works so well, and brings life to even the most generic cards. As heard in the video from before, the dealer will throw quips at the player regarding nearly every card. When you draw a card that gives you money, he will say things like “more gold for you, and with it more problems” (if you’re unfamiliar with the term, he’s referencing “mo’ money mo’ problems). The designs of the cards add onto the beautiful dark and dim aesthetic. There’s a sort of constant uncertainty as to whats going to happen with every move you make, and the great music adds and narration add onto this feeling of uneasiness. Every card adds onto the adventure, either throwing enemies at you or forcing you to make a choice where you must weigh your chances of survival against what you’ll game with your decision. There are cards that add more cards onto the board, creating pseudo-quests which you ca complete. You can choose to finish these quests, and gain a card, or receive a significant negative effect while gaining powerful equipment or a large sum of gold. This allows for the player to make key decisions which usually decide whether or not the player will survive a run. If I find a legendary weapon, a merchant card may offer to pay me extra in exchange for the weapon. I have the choice to either keep the weapon, which will likely be really useful if the enemy the weapon is effective against is common, or sell it for a chunk of gold which I may need to buy food in order to survive. Normally I would want to keep the weapon since it would make combat easier, but another incentive to sell it is to get the card’s coin. When you get a coin, you unlock two or more new cards which you can use in future playthroughs. The amount of times I’ve died from starvation is crazy, and just proves that managing your health and food is so important. Because there is no micromanagement, the time in-between battles feel less stressful, as you only have to manage three things: your health, food, and equipment. If there was too much micro management, e.g. having to purchase bandages for wounds which would damage you over time, the player would always feel panicked. With only three resources to manage, traveling feels more like preparing for a battle rather than constantly fighting one. This game has so much replayability as a result of all the different kinds of cards and ways to play. There are different kinds of characters you can play as which will present different challenges and give you specific buffs. Because there are so many different play styles available, you want to play through each character and complete their stories. Some of them are fairly basic, but nonetheless they all provide a decent challenge. Each character has a card unique to them which create a sort of story for each character you play as. This addition is one of the best parts of the game, as some of the challenges are fantastically fun to play in endless mode. Even after losing on some of the hardest challenges I was so intent on completing them I couldn’t stop coming back to the game to try and beat the challenges. Hand Of Fate’s combat is very similar to that of Batman Arkham in that its very fast paced, and has you using mostly regular attacks and countering enemies. Combat does feel fairly heavy and is very responsive, but beyond regular attacks and counters, there’s nothing very special about the combat. There are items which vary up the combat, acting as skills. Some give you money every time you hit an enemy, and others give status effects to enemies when they are hit. Weapons can also have skills with similar effects. Because you can only equip one skill and weapon at a time, you wont end up using them very often, nor will you need to since you can beat just about every battle without any skills or special weapons. This game doesn’t play well in really long playthroughs, and playing one game every once in a while is a much better experience than constantly playing it. I took a while to write this review as a result of this, and usually played 30-45 minutes every week. Hand of Fate is a really unique game, and deserves to be praised for it. I doubt many people wouldn’t have fun playing this. The game has a ridiculous amount of replayability, and doesn’t have any low points that cant be easily worked around. Thanks to the intuitive gameplay and unique challenges, Hand Of Fate is a great game to come back to playing every once in a while and even better for completionists.